So you've finished designing your portfolio and want to publish it to the web. We designed a system to allow you do just that. 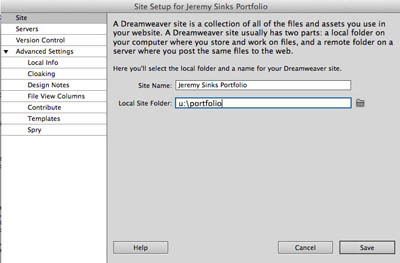 Before you "put" your portfolio over to the web, we want to make sure all setttings for the site setup are correct. 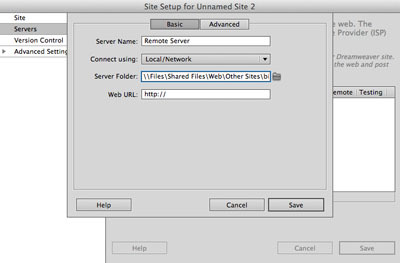 Check the file path in the "Local Root Folder" box – you should see "u:\portfolio"
Make sure the Connect Using box is set to "local/network"
In the URL bar, type the following – add appropriate characters for your portfolo: http://bisstudents.cratercomets.com/class_of_201?/lastname_firstname_portfolio/"
If you have updated a page in any way, you will need to put that file over on the web server for those changes to appear on the web. You may see a dialogue box open that says "Should dependent files be included in the transfer?"